This entry was posted on April 25, 2016 by Lightning Labels. National Small Business Week runs from May 1 through May 7, and acts as a great time to celebrate entrepreneurship in the United States. Small businesses contribute disproportionate amounts to employment and gross domestic product compared to their larger counterparts, and the first week of May will act to raise awareness regarding the importance of these firms to the nation as a whole. Entrepreneurs and local communities are encouraged to participate. Because one of the toughest parts of running a small business involves brand visibility, the event can be capitalized upon by leveraging special marketing campaigns that raise awareness. Especially when operating a brick-and-mortar location in a smaller community, entrepreneurs should jump on the opportunity to increase brand presence. Now, while local marketing will be more straightforward, small manufacturers should also try to get in on the action. The use of custom labels to indicate not only the contents of the product packages, but the fact that the items were created by an entrepreneurial firm, can certainly help to boost value on the shelves. 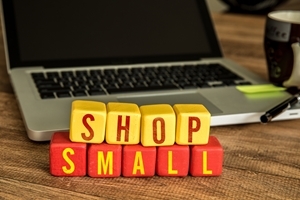 Since a few years ago when American Express first launched Small Business Saturday - a counterpoint to Black Friday - it has become clear consumers want to support early-stage companies. Small Business Saturday has dramatically increased foot traffic and revenue among entrepreneurial firms Thanksgiving weekend, and Small Business Week is similarly effective in driving sales and traffic. However, entrepreneurs cannot realize the benefits of that support without making it known that they are indeed operating small businesses, and that the products were crafted in a more careful fashion than their large-enterprise equivalents. Marketing and product packaging can sometimes be expensive, especially when leaders are going through their first startup phase. Options are available - many of them online - to get a more seamless and efficient experience when shopping for marketing materials. This includes custom labels and stickers. As all entrepreneurs already know, competition can be fierce throughout the year, and failing to differentiate their brands from others' in the market will make it all the more difficult to excel. Going the extra mile to craft and execute a winning product packaging and advertising strategy ahead of Small Business Week can help to inject a little life into the brand ahead of the busy, active summer months. Custom labels and stickers are affordable and simple means to the end of boosting recognition through more aesthetically pleasing designs and imagery. What's more, if entrepreneurs get moving now, they can print labels and stickers that also raise awareness of National Small Business Week itself, contributing to the entrepreneurial sector and aligning the brand with the event in one fell swoop. Lightning Labels is an industry leader with respect to the speed of order fulfillment and accuracy of printing. The firm also offers a range custom label, sticker and other product packaging materials through easy-to-use online portals.